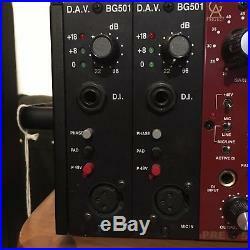 DAV BG501 preamp unit for API 500 series lunchbox type racks. Based on the famous classic Decca preamp design, it sounds superb! Perfect working order, it's been used but very carefully looked after and it really is just as good as new. 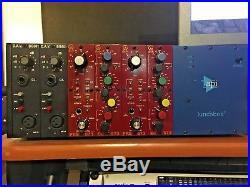 PLEASE NOTE: I have two of these for sale, but this listing price is for one preamp unit only. Also this listing does not include the other 500 series units pictured, or the API Lunchbox rack unit. These are all for sale in separate listings though - see my other items if you're interested! The item "DAV BG501 Broadhurst Gardens 500 series microphone preamp & DI unit" is in sale since Wednesday, June 6, 2018. This item is in the category "Musical Instruments\Pro Audio Equipment\Preamps".